You’ll find 8 easy-to-use teamwork tools to keep everyone engaged and on task. 1) Use Time It! to help teams manage their time wisely. Enter a countdown time and press Start—all the red lights light up, then turn off one at a time as time elapses until the TeamTimer announces, “Time’s Up!” and sounds the alarm. 2) Press Who’s Up? to randomly pick one teammate. 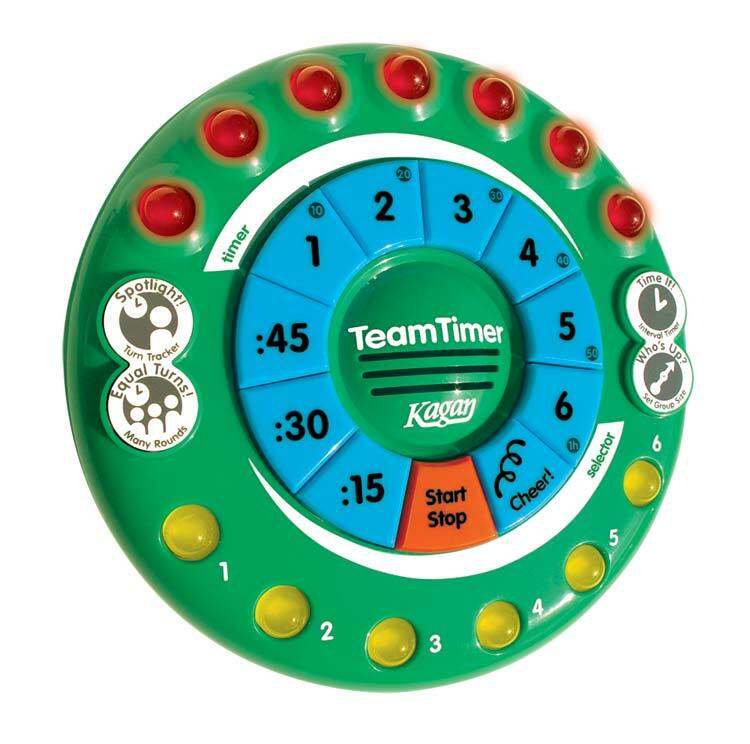 The TeamTimer makes a spinner sound, then lights up the selected teammate’s yellow light and calls out his/her number, “Three!” Random selection keeps everyone on their toes. 3) Give the team a set of questions. Enter a time and press Spotlight! The TeamTimer picks a teammate to share, then counts down the teammate’s share time. 4) Want to make sure everyone’s participating about equally? No problem—press Equal Turns! to give every teammate the same time allotment to make their contribution. 5) Use Many Rounds to give teammates multiple rounds of timed turns. 6) Eliminate your team “Hogs” and “Logs” with the Turn Tracker. No one can take a second turn until everyone has participated. 7) Use the Interval Timer to count down and beep every time your set time interval is complete so teammates know it’s time to switch roles or switch gears. 8) Press the Cheer! button to cheer on a teammate with one of five team celebrations. The TeamTimer makes teamwork more engaging and successful for everyone. Requires 3 AA batteries, not included. Ideal for teams of 2–6 students.